TROPIC AIR ANNOUNCES ADDITION OF KING AIR AIRCRAFT TO ITS FLEET. 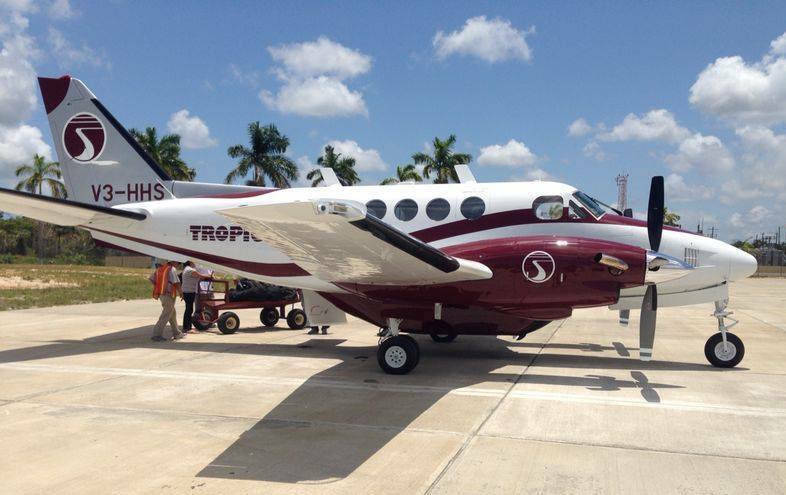 Tropic Air announced today the arrival of its Beechcraft King Air A100 aircraft to Belize. The King Air is a pressurised, air-conditioned, high-speed, twin-engine, jet prop aircraft. Its pressurised cabin is designed for high altitude and high-speed (250 mph) flights. "Its two abreast seating in a 12 passenger configuration will also allow for the higher level of executive seating that our passengers are asking for" said John Greif III, President of Tropic Air. "We were pleased to introduce the modern glass cockpit Cessna Caravan to Belize, and now we are pleased to once again raise the bar of air comfort for our passengers with the King Air"
After a period of crew and support service familiarization, the King Air will be used on routes to Roatan, Merida and daily flights to Cancun. It will also appear on other international routes, such as San Pedro Sula and Flores, Peten from time to time. Tropic Air operates a fleet of 12 aircraft to 16 destinations in Belize, Honduras, Mexico and Guatemala. With over 270 employees, Tropic Air launched flights to Merida, Mexico in March of this year.